Take a look at the NEW store! When I graduated and could not find a job, I started my own business. A friend and I borrowed money on our Visa cards and opened the store at Spicertown near Akron University in August 1969. Our first paying customer was the telephone installed, he is still a regular customer. In December we did $7000.00 for the month. Now we have days that are $7000.00. My friend dissolved the partnership and I ran the store myself. 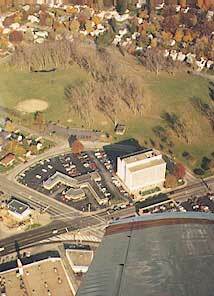 I incorporated in July 1970. I bought Akron Camera Exchange and had two locations for a while. But the customers went to the new location and we closed the original. In 1981 I went back to school for my Master's and stopped running the store on a daily basis. 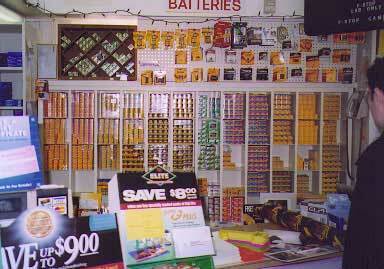 My wife Margaret and Jack Darrow continue to run the store to this day. Margaret is President and General Manger and Jack is Vice President and Sales Manager. These are some views of the store today. 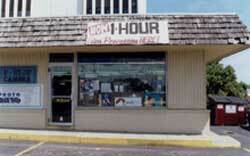 We carry the largest selection of 35 mm film in the Akron area. We carry supplies for the amateur photographer. 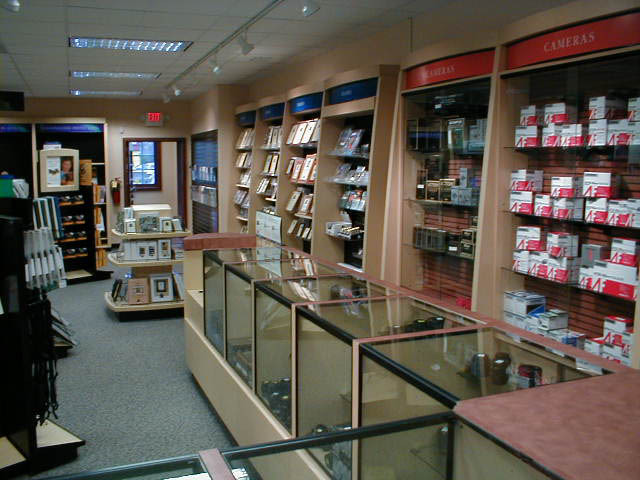 Bags, flashes, batteries, darkroom supplies, filters are just some of the many items we carry. We have a large selection of both new and used cameras. 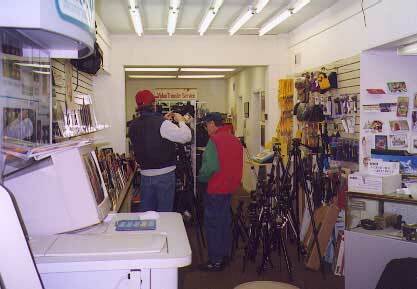 We carry Nikon, Canon, Ricoh, and Olympus Slr's. 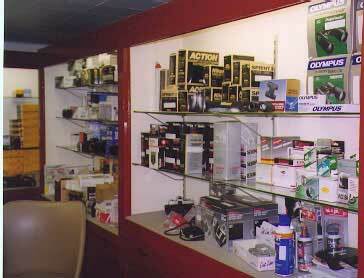 We have both 35 mm and APS point and shoot style cameras. 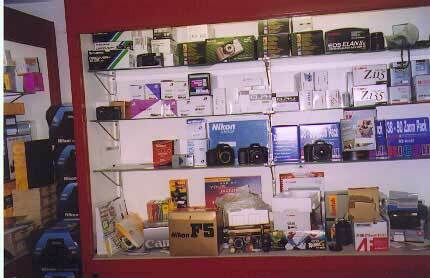 Nikon, Canon, Olympus, Ricoh, Yashica, Leica, Kodak, are the brands that we carry. We carry binoculars, slide trays, electronic flashes, lenses and all the other things one needs to get the pictures you want. The Photo Ditto machine that you can see in the foreground lets us make digital images of existing photos. We can make enlargements or reductions of either color or black and white images. As you can see we carry a selection of tripods, straps, and lots and lots of frames. 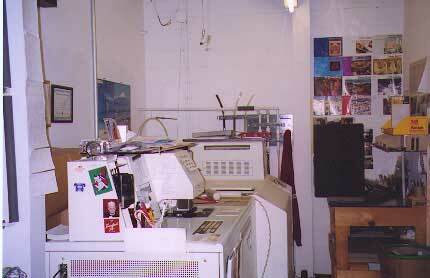 These machines are the ones that develop your film and print your pictures. This is where we are different from other labs. The technician looks at the negatives before they are put into the printer and makes adjustment before they are printed. Then another technicians looks at every picture and sends it back for remakes before you ever see it. We take pride in giving the customer the best print from your negative. 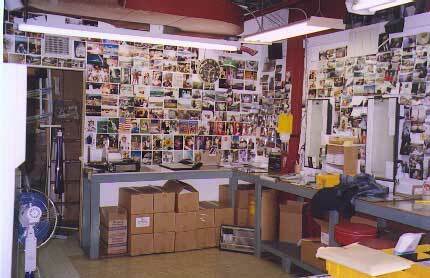 Our photo lab covers our entire basement. This is the machine that lets us make enlargements from 5x7 up to 12x18. 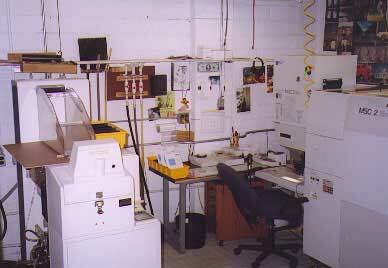 This is also the area where we make copy negatives, and negatives from slides. This is our finishing area where technicians cut the negatives and do a final quality check on the photos before they are priced and bagged. 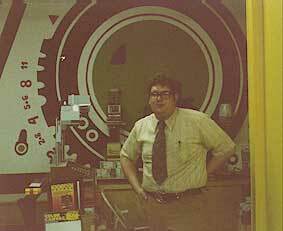 Here is a photo of me in the original store. 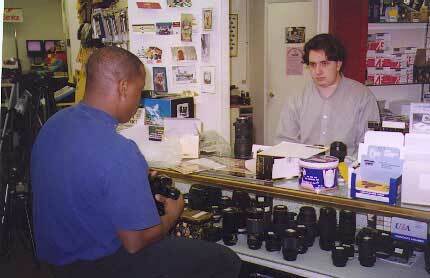 This is a 110 photo that is not great, but the store for in amateur photography now longer exists!